The BE2C flown by Capt A J Lidell VC from WWI, a Handley Page Heyford from the 1920's, the Short Stirling - the RAF's first 4-engined bomber, the famous Avro Lancaster, the Vickers Valiant one of the RAF's V-Force Nuclear Bomber Force, the English Electric Canberra and finally the Boeing Vertol Chinook which the Squadron has operated from 1982 to the present date. Also included are depiction of the VC as won by Capt Lidell, the unofficial inter-wars years badge, the "Pathfinder Badge" and the current official Squadron crest. Each print will be signed and dated by the artist the print is printed on semi-gloss medium weight pape,r approx size 20 x 16 inches and is delivered rolled in a cardboard tube. Cost £27:50p including postage in UK (overseas postage cost on request). 10% donated to Association Funds on every purchase. 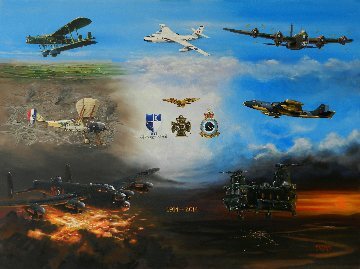 7 Squadron Lancasters, Oakington 1943 was originally displayed and sold at the Guild of Aviation Artists Annual Exhibition 2013, it formed a group of four paintings which were runners-up for the Bonham Trophy presented for the best group of 4-paintings by a member of the Guild. 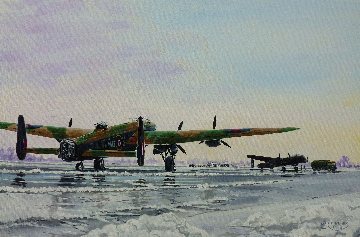 The painting depicts Lancaster MG-S at dispersal in the early morning light whilst another aircraft is prepared for flight, the print is approximately 20 x 14 inches printed on semi-gloss medium weight paper, it is delivered rolled in a cardboard tube and signed and dated by the artist. The cost is £27:50p including postage to UK (postage to other locations on request). 10% of all sales donated to Association Funds. The distinctive Short Stirling with its stalky undercarriage on short finals at RAF Oakington. Each print will be signed and dated by the artist the print is printed on semi-gloss medium weight pape,r approx size 20 x 16 inches and is delivered rolled in a cardboard tube. Cost £27:50p including postage in UK (overseas postage cost on request). 10% donated to Association Funds on every purchase. More 7 Squadron Aircraft Prints on the next page. 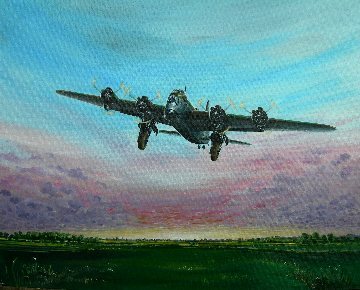 If you would like to commission a painting please contact Mal Reeves, paintings are normally completed in Acrylic paint on Canvas board to a size of your choice, each painting will be priced depending upon the complexity of the subject. Pencil drawings are also available and are normally cheaper! !